In an age of mass tourism, finding ways to escape the crowd is becoming increasingly challenging. But for those who relish the notion of leaving the well-trodden path behind and, free from crowds, traffic or even schedules, sailing off as master of their ship into the wide blue yonder, Simpson Marine has just the solution. Asia’s largest yacht sales, brokerage and service company, with 20 offices in seven countries around the region, Simpson Marine’s Yacht Charter Agency offers the opportunity to set sail aboard a luxuriously equipped private yacht for durations ranging from a day to weeks or even longer – and in stunning locations that include Indonesia, Myanmar, Thailand and Vietnam, as well as the Caribbean and the Western Mediterranean. Among its large fleet of charter vessels, which spans motor yachts to superyachts, is a choice of twin-hull catamarans that provide an especially spacious, comfortable and stable five-star cruising platform, each one of which is fully and professionally crewed, and ready to transport you and your family or friends on an unforgettable voyage of adventure. Based on the Thai island of Phuket in the ultramarine Andaman Sea, the 15.85-metre Lagoon 52Blue Moonwas launched only last year, yet is already available for weekly charter. Fully air-conditioned and crewed by a skipper along with a hostess, who spoils guests with gourmet cooking, this beautiful French-built contemporary catamaran is designed by a team that includes former Renault head of styling Patrick le Quément, with interiors by the Italian Nauta Design agency. Equipped with state-of the-art facilities, Blue Moonhas four queen-size, en-suite cabins and a further bunk cabin, and offers accommodation for up to 10 guests. In addition to a large salon, it also has an outdoor lounge. Also from the same design team but slightly larger, the ultra-refined 16.47-metre Lagoon 560 Ellen Sophiais based for the duration of this year in Nha Trang on the Vietnamese coast, where islands, beaches and hospitable fishing villages are all within easy reach. Air-conditioned throughout and with a crew of up to four, this twin-hull vessel accommodates up to eight guests in four en-suite cabins, three with double beds and one with pullmans. Additional to the main-deck saloon, which is equipped with the latest audiovisual equipment, there’s also a flybridge that’s spacious enough to include sun-lounging and dining areas. Much further afield, the stunning 23.28-metre Lagoon Seventy 7 Joyis available in the Caribbean for all-inclusive weekly charters. This magnificent ocean-going luxury catamaran is designed for a wide range of capabilities, from coastal cruising to global exploration, and can carry up to eight guests in three double cabins and one twin, all of which have their own private bathroom. Incredibly spacious and equipped with every conceivable amenity, it’s the perfect vessel in which to explore the world’s most paradisical cruising grounds. 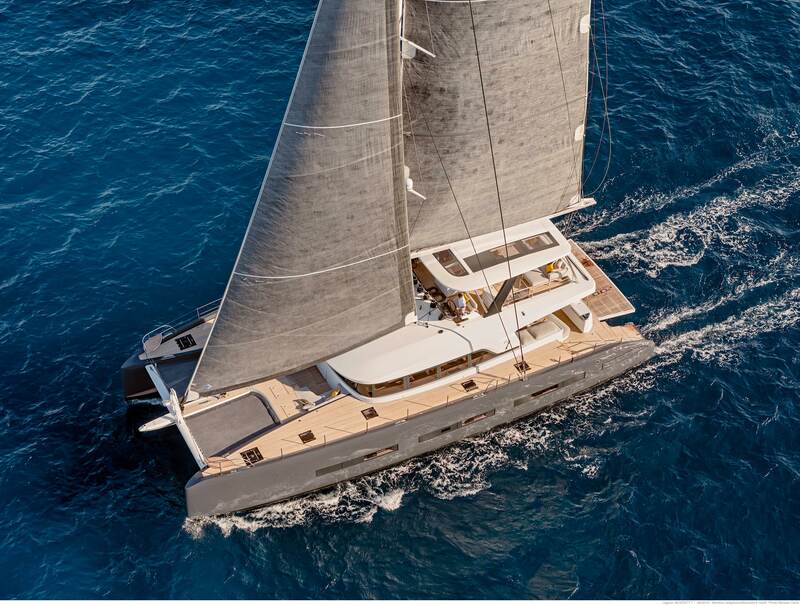 And for those who’d rather stay close to home, the 22.3-metre-long Sunreef 70 sailing catamaran Fengcan even be chartered right here in Hong Kong, where more than 730km of coastline and 263 islands add up to a cruising heaven. With Simpson Marine’s Yacht Charter Agency, leaving dry land behind and sailing off into the sunset really is an option. Not only will you enjoy your most memorable vacation ever, you’re also assured that Asia’s most experienced, passionate and dedicated team of yachtsmen and women are at your service during every moment of your oceanic adventure.